I am a big fan of the Cheesecake Factory brown and sourdough breads they bring to the table. My wife and I both favor the deep brown bread they serve, which is similar to the bread served at Outback restaurants. Last time we were there, she said “I bet you can’t duplicate this bread at home!” An interesting challenge. The bread is a deep brown color and the top is loosely peppered with oats. The flavor is rich and robust, and there is no detectable amount of rye in the bread. My first inclination was to see if the Cheesecake Factory published this bread recipe on the Internet. It is not, but I did find out some interesting information. The breads served in Cheesecake Factory come from the Maple Leaf Bakery, and this particular bread is called the Sweet Wheat and Oat Demi Baguette. Their description states “Brown sugar and molasses give this soft-textured demi baguette an irresistible, unique flavor.” Indeed. To prepare the bread, I added the warm water, melted butter, honey, wheat flour, cocoa, granulated sugar, instant coffee and salt to the bowl of a stand mixer fitted with the paddle attachment. After thoroughly blending, add the yeast, malt and ½ cup of the bread flour. The mixture will be soupy. Add the remaining flour, ¼ cup at a time on low until enough flour has been incorporated that the mixture just begins to pull away from the sides of the bowl. Continue mixing for 7 minutes on medium. Remove the bowl and dump the dough onto a floured board. Bench rest for 5 minutes. Knead with floured hands until there is sufficient gluten development. When the dough is slightly springy, transfer to an oiled rising bucket and rise until doubled, 1 to 1.5 hours. When the dough has doubled in volume, pour it onto a floured surface. Divide the dough into four equal portions. 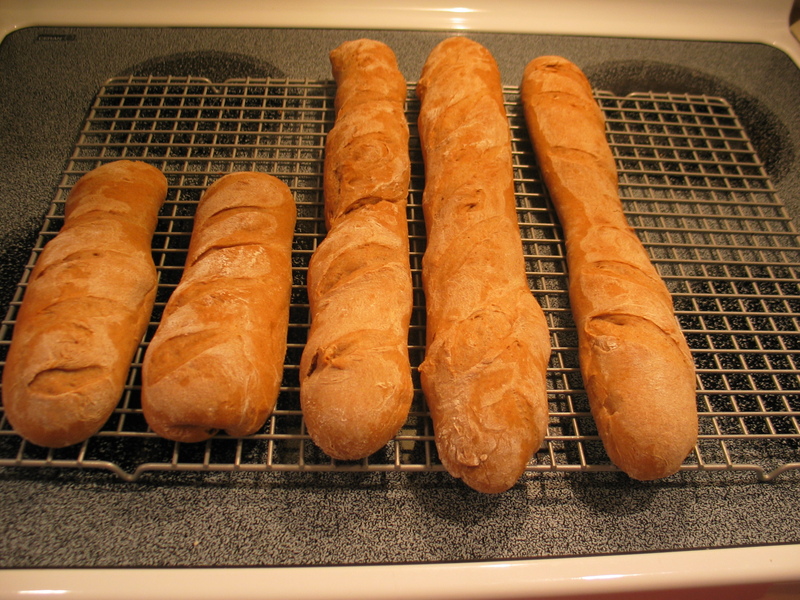 Make three baguettes suitable for placing in a 3-loaf baguette pan that has been sprayed with cooking spray. The remaining piece can be divided in half and shaped into mini baguettes or rolls. 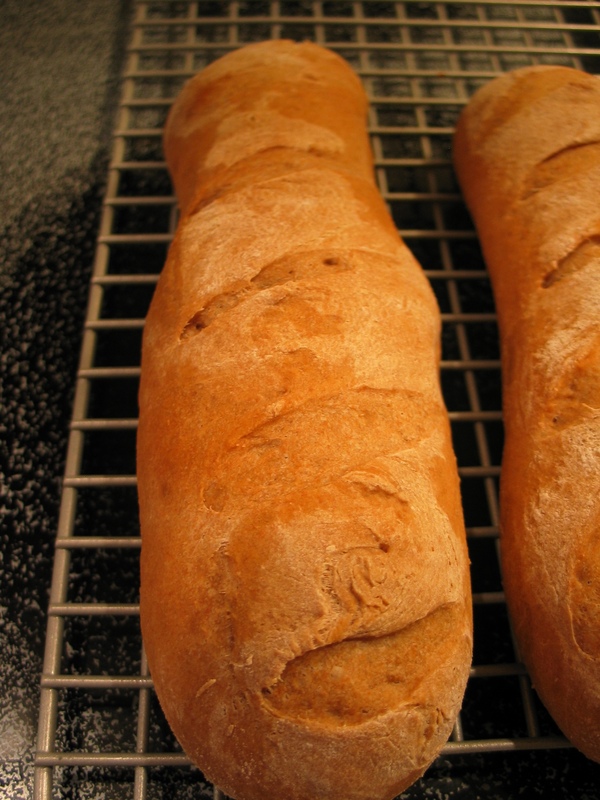 Let the baguettes rise until almost doubled, or until pressing the dough lightly with a finger causes the dough to fill back in in several seconds. Just before baking, score the tops with your favorite pattern. Bake the loaves in an oven that has been preheated to 350F. Bake for 22 minutes or until done. Impressions: My family was impressed with how soft the loaves were coming from the oven. They also put off an incredible aroma while baking. The crumb is identical to the Cheesecake Factory bread, but the color is too light. We all agreed that the loaves need to be 3 shades darker. The taste is very similar, but has deeper notes of chocolate and coffee. Note that I omitted the oats because my stepdaughter is allergic to oats. I intend to try these changes and report back here in the near future. I believe the substitution of molasses for honey and brown sugar for granulated sugar will more closely replicate the flavor of the Cheesecake Factory bread. The addition of the diastatic malt powder and the caramel color will darken the crumb and the crust. i love their bread too. must give this a try! Do you have a standard oven? The texture of that bread turned out great! Hi, thanks for your post. Were you able to make this bread again with the new ingredients? If so, was it similar to CF bread? Yes, it turned out very similar to the CF bread. I used barley malt syrup instead of molasses. The caramel color and malt syrup added an extra shade of darkness to the bread. – I don’t drink coffee, so I didn’t have any. I skipped it and the flavor still seems great to me. – I have no idea what diastatic malt powder, that was also left out. Like I said, they turned out great. I started eat almost immediately after taking out them out of the oven. My initial thought was that they weren’t quite sweet enough. I’ll have to taste tomorrow to see if that’s still the case. Either way, this turned out fantastic and I wanted to thank you for your recipe and suggestions! Had a go at this using the second set of ingredients – but without coffee or the malt thing. Turned out really well! Colour was spot on -though taste wise I reckon a little more sweetness needed. Didn’t have a baguette tray so made small rolls instead using a floured muffin/cupcake tray! 22 mins was exactly right. Thanks for the recipe!! Just made the bread with the second recipe. Needs to be a little sweeter, also had a bitter taste to it. Don’t know what it could have come from.